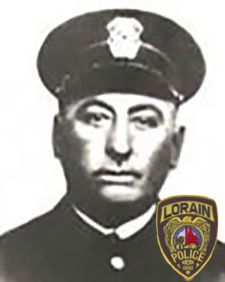 On November 6 1925 at 7:00 p.m. Patrolman Deal was assigned to investigate an accident and direct traffic near the Lorain-Ashland railroad crossing on Elyria Lorain Road. A garage man positioned the wrecked car in a ditch so it could be pulled out and at this point, Officer Deal halted the traffic. Several cars had stopped when a car came speeding down the road, passing the stopped automobiles. Witnesses advised the car came at such a high rate of speed Deal had no chance to jump for his life. After hitting Deal, the driver turned off his lights and headed north for Lorain. Fradley, the garage man ran to the first car Officer Deal had stopped and asked the driver to follow the car and try to obtain the license number. The driver said, “Nothing doing.” Fradley then asked the next five cars to pick up Officer Deal and take him to the hospital. Everyone refused. Finally a car was commandeered and the officer was taken to St. Joseph’s Hospital where he was pronounced dead. It had been noted that the speeding car’s radiator was leaking badly and Chief Walker ordered a search for abandoned cars with damaged fronts. All public garages were alerted and garage owners ordered to report all damaged cars brought in for repairs, paying particular attention to radiators. Nearby Police Departments were also alerted. On November 7, 1925, 19 year old Wesley Homolka gave himself up to Lorain Police on the advise of his father. He appeared in court on Monday, November 9, 1925, and denied manslaughter charges. Mr. Homolka was released on bond and was to appear for a preliminary hearing. There was no information on the outcome of the charges. Officer Deal was affiliated with Lorain Aerie 343 Fraternal Order of Eagles and the Fraternal Order of Police. He was survived by his wife, son, father, and two sisters. Charles C. Deal’s name is inscribed on the National Law Enforcement Officers Memorial Wall, Washington, D.C. panel 46, east wall, line 1.